RuPaul shared when he first realized that life shouldn’t be taken seriously when he was a child watching TV. RuPaul also explained why he thinks “Drag Race” has now become a phenomenon. In another clip, Oprah points out that Ru goes deep with contestants on the show. “It’s amazing. It’s often on your show you seem to be giving spiritual advice,” Oprah says. “We set up the situation on this competition reality show where we challenged them to go beyond their own limited perception of themselves,” Ru says. “That is the greatest spiritual teaching there is,” Oprah adds. “The real challenge is for them to be willing to die and become reborn,” RuPaul concludes. 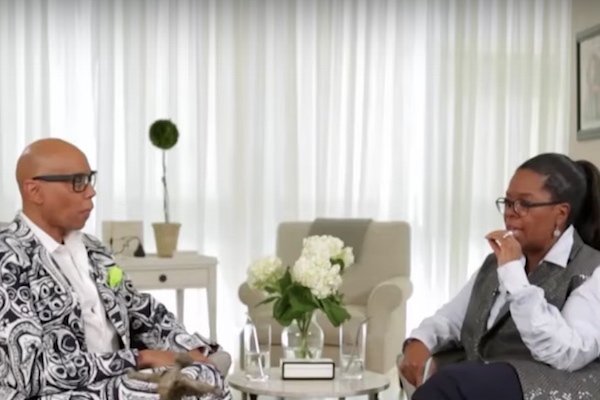 Read RuPaul’s interview with Oprah here.